Every TV news item you see on termites is the result of them crossing a barrier to get into the building. 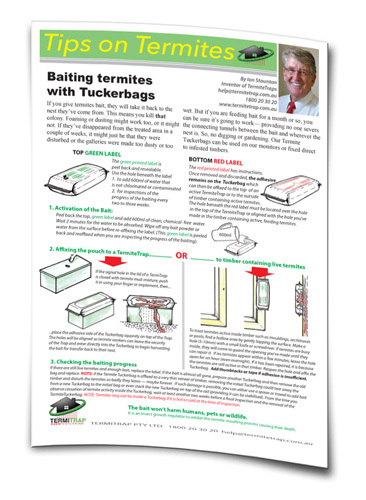 Placing TermiTraps around your home gives wood-eating termites some easy-to-find decoy timbers so they don’t have to continue on to find timbers up inside the house. The tyranny of termite instincts. As a colony and as individuals, termites can only follow what has been programmed into them for millions of years. Each unfailingly follows their caste role; circumstances may differ but their instincts cannot change. It makes it easier for us to defend our homes once we understand this tyranny of termite instincts. Termite scouts are constantly searching for additional food. They always protect their environment to retain humidity and exclude ants using a ‘mud’ mixture. 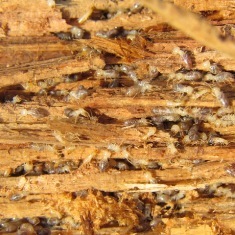 The worker termite’s main job is to find food, return to the nest and feed the nymphs and Royalty like an endless conveyor belt. It’s what they do. The base is open, allowing them access to discover the food source. 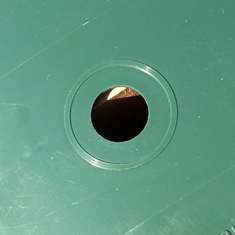 We’ve left an open hole in the lid which they seal to control humidity loss. This tells you when they’ve arrived. By feeding them a bait which is more palatable, they take it back, instead of chewed wood. When scouts find a Trap, they ‘report back to base’ and tunneling is commenced to the new food site. 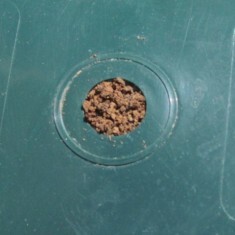 Once the Trap is sealed up around the base, they seal up the hole in the lid. This is your signal to add the bait! 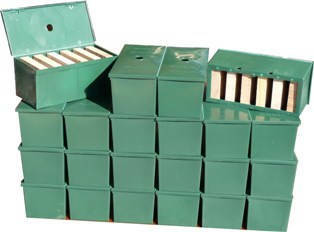 There are 22 Traps in a carton to spread around about 3 metres apart. There is no digging. Place them on the garden soil, over the cracks between pavers, over expansion joints against the wall or in sheds, etc. Check the signal hole in the lid as you walk past or at least every 3 months.